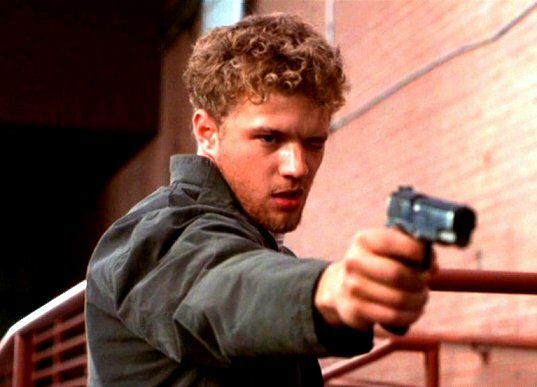 Ryan Phillippe = pretty boy teen heartthrob. Or, at least, that's the common perception of the staple of many a teenybopper magazine cover, a result of his appearances in popular youth-aimed films such as I Know What You Did Last Summer and Cruel Intentions. For Phillippe, the fame is a childhood dream come true--but at 26, it's no longer quite enough. "When I was 16 years old, that's all I wanted--to be famous and have a lot of money. But when you get older, your perspective changes. What you want out of [acting] mutates and becomes something bigger. I take it a lot more seriously than I was 16; that was 10 years ago. As an adult, you're driven by something else." That "something else" led Phillippe to sport a scruffy beard and pack some serious firepower in his latest project, the violent, un-teen-friendly crime thriller The Way of the Gun. As dramatic a stretch as it seems, this project is in fact more in line with Phillippe's personal tastes. "I'm not drawn to what is typical. I don't want to be considered typical at [acting]. So I'm trying to follow my interests more--now that I have choices. When you're first starting out, you do what you can to get by, like these guys in the movie. You just take what you can to get you to a place, and once you get there, you try to be smart with it and try to handle it the right way and do movies you think could have an impact and are original." Among the more "original" films on Phillippe's resume are the little-seen indie drama Little Boy Blue and maverick filmmaker Gregg Araki's Nowhere, which he has juggled with the higher-profile films (also including the Miramax releases 54 and Playing by Heart) that have garnered him most of his notice. Phillippe sees his career pattern as not only rewarding but necessary. "I think every actor would ideally like to have the balance. Occasionally you do the movie that's gonna pay you well, especially when you have kids, or when you want a movie to make enough money that a studio will then let you make the film you want. But at the same time, you got to balance that with what creatively gets you going, which is a movie like [The Way of the Gun]. This is the kind of movie I want to see." The Way of the Gun, however, is not necessarily the type of film his young female fan base would like to see, nor is it the type of film filmmakers see him in. In fact, it was an uphill battle for Phillippe to win over Gun writer-director Christopher McQuarrie. "I understood why he would have reservations. I knew what the perception of me is for the most part. When I read the script, in truth I could see the guy older and bigger. [But] I felt that I could make the transformation." And transform he did, packing on 25 pounds of muscle to play the role of Parker, who, along with Benicio del Toro's Longbaugh, kidnap a very pregnant woman (Juliette Lewis) as part of a ransom scheme. The role also required Phillippe to undergo a mental adjustment of sorts, for during the time of filming Phillippe and wife Reese Witherspoon were expecting a child themselves. "There were times where definitely it hit me how strange it was when we had to rough [Lewis' character] around or whatever. I tried to separate as much as I could, but also there were times I was so emotionally involved in what was going on with Reese even though she was away from me that I think it left me at this sort of really 'open' place that kind of worked for the character. These characters are kind of running on empty, and they are guys who have been through a lot, so the fact that I was having to be pulled in so many different directions kind of lent itself to the stuff with Juliette. It's very to easy to understand even the most hardened criminal feeling for a woman in her condition and also what we're putting her through. It was weird." What obviously isn't strange for Phillippe is expanding his own horizons. While continuing to pursue varied acting jobs, he's also delving into other areas in show business. He recently set up a film production company, and on the drawing board is a project for the World Wide Web. "Seth Green, Breckin Meyer, and myself have something that we want to do which would ideally be a smarter version of MTV in a sense: short films, animated shorts, lengthy discussion about music, have different people introducing new styles of music--things like that." Given the rash of crime films that have been released in recent years, one could be led to think that The Way of the Gun is like all the rest, but Phillippe thinks the film stands apart. "There are aesthetic similarities [to other crime films], but I think there's a lot more of an honest story told here in a sense where it's obvious in some of those movies who the 'bad guys' are and who the 'cool guys' are. In this movie I think you make up your mind as you go along. There's shades of good and bad in each character in this movie, and you're constantly trying to figure out whether or your allegiance is with them, or whether or not you hate them. It's not as black and white." Neither is the career of pretty boy teen heartthrob Ryan Phillippe.